Update April 2014: for information on Inequality and Democracy see here. Second, how it actually is distributed. 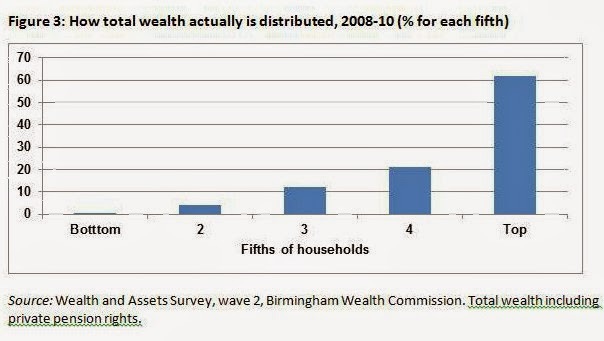 The bottom fifth in fact has hardly any wealth to speak of – less than a tenth of a per cent of the total. Some have ‘negative wealth’ – debts that outweigh their assets, even including personal possessions. 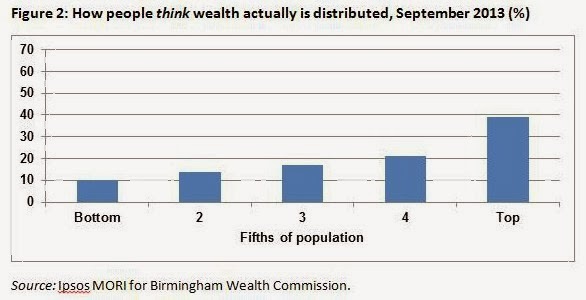 The next fifth doesn’t have much either – just 4 per cent of it. But the top fifth have 62 per cent – half as much again as people think and nearly double what they say they think is fair. "The overall share of the top tenth in total wealth was 850 times the share of the bottom tenth. Even the least wealthy of the top tenth had 75 times the wealth of the household just at the top of the poorest tenth." Tax, of course, plays a major role in all this. And remember: this is probably an under-estimate - for these reasons. All of which raises an interesting question: how soon will we see the world's first trillionaire?